The SCMT has been sponsoring multi day races in the New York area for over 30years. In 1985 we offered our first 1000-mile race in Flushing Meadows Park, the first of its kind in this hemisphere in this century. Three runners actually completed the distance in the allowed time frame. In 1987 Sri Chinmoy increased his vision of the running world. He felt that a longer race of 1,300 miles would inspire a challenge for the ultra marathon runners. The Ultra Trio was born- a set of three ultra races of 700, 1,000 and 1,300 miles. World-class distance specialists began to attempt the increasingly difficult mileages. The Marathon Team held national and world championship events in 1988 and 1989 at Flushing Meadows Park. The 1988 1,000-mile event was the I.A.U. (International Association of Ultra runners) World Championship. Yiannis Kouros of Greece ran 1,000 miles in 10 days, 10 hours, breaking the previous record by 1 1/2 days. Suprabha Beckjord of Washington D.C. won the women's 700-mile race in American Record time. Sandra Barwick of New Zealand set a new world standard for women at 1000 miles in 14 days, 20 hours. One year later Al Howie of Scotland became the first person to complete the 1,300-mile distance in a certified race (17 days 9 hours). 1989 saw the women's world best for 1000 miles claimed by Suprabha Beckjord as she broke Sandra Barwick's time by a mere 27 minutes. The 1991 Ultra Trio had a field of over 60 runners for all three races- unheard of considering the great distances being attempted. Al Howie came back to break his own record for 1,300 miles by 13 hours and Sandy Barwick became the first woman to run 1,300 miles in a certified race; as well she smashed the 1,000 standard by two days! In 1992 Beckjord returned to join the super elite group who have run 1,300 miles in a certified race, which totals ten men and seven women. In the 1993 1,300 miler, Istvan Sipos of Hungary broke Al Howie’s record by nearly two hours. In 1994 Antana Locs of Canada won the 1300 miler overall, and was the first person to ever complete the 1300 three times. In 1995 Georgs Jermolajevs of Latvia broke the world mark for 1300 miles in 16 days 14 hours. Georgs Jermolajevs returned for victory in 1996 in the Sri Chinmoy 2700 Mile Race. He astounded the running world with a fabulous victory in 40 days 11 hours, an average of 66.7 miles a day, leading four other finishers across the line. Suprabha Beckjord became the first female to finish the 2700 miler in 43 days 1 hour. Then Sri Chinmoy announced a longer race would be held the following year. In 1997, Edward Kelley of California conquered the heat and humidity of the New York summer to win the inaugural 3100-mile race in 47 days, 15 hours- averaging 65.1 miles per day. Suprabha Beckjord became first female ever to finish 3100 miles in 51 days two hours. The runners managed the equivalent of New York to California on foot. In 1998, Istvan Sipos of Hungary out dueled Ed Kelley, leading four finishers across the line in 46 days 17 hours, a remarkable 66.3 miles per day. Five starters in 1999 were subject to temperatures reaching between 90º and 100ºF for much of a record setting July, but somehow Edward Kelley won for the second time in 48 days 12 hours. In 2000, the four starters experienced cooler days, with three finishers led by Ashprihanal Aalto of Finland in 47 days, 13 hours. Mr. Aalto repeated his win in 2001 in a small field with three finishers. The number of finishers doubled in 2002 as Madhupran Wolfgang Schwerk of Germany broke the world best by over four days in 42 days 13 hours, averaging an astounding 72.8 miles per day. Ashprihanal Aalto also slipped under the previous record by a few hours to finish second, and Suprabha Beckjord made her sixth finish in as many attempts. In the 2003 race, Namitabha Arsic from Yugoslavia prevailed over a field of seven. Suprabha continued her string of finishes with seven straight. Ashprihanal Aalto returned to win again in 2004 in a personal best of 46 days six hours. Suprabha won again for eight straight finishes. In 2005 Ayojan Stojanovich of Serbia surprised with a fastest first time victory in 46 days 10 hours. Suprabha Beckjord kept her streak alive with nine in a row. 2006 was a record year again as 15 starters were led by the stupendous performance of Madhupran Wolfgang Schwerk. He eclipsed his own record by 29 hours (41 days, eight hours), which was the top performance of all-time. Suprabha Beckjord made it ten straight with another finish. Mr. Schwerk pulled the first ten finishers to personal bests as well. In 2007 Ashprihanal Aalto won again in a new personal best of 43 days four hours, his seventh finish. He remains the second fastest man all-time at 3100 miles. 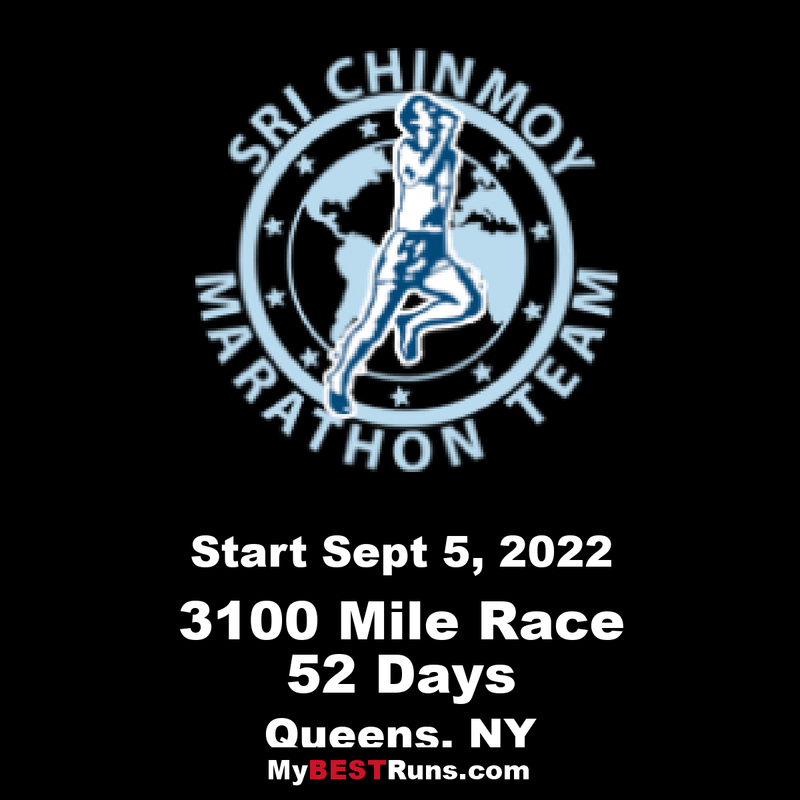 With the sudden passing of our beloved Sri Chinmoy in October of 2007, the Marathon Team vowed to continue the multi day races in memory of his inspiration and vision. Ashprihanal Aalto repeated again in 2008, 2009,and 2010 as the winner, making it seven victories. Suprabha Beckjord reached 13 consecutive finishes- the most ever. She was also the oldest finisher in 2009 at age 53.In 2011, Sarvagata Mikhailo Ukrainskyi of the Ukraine ran the fastest first time performance in 44 days13 hours to claim victory. Surasa Mairer of Austria became only the second woman in history to complete the race. In 2012 four-time finisher from Australia Grahak Cunningham became only the third man to ever average 70 plus miles per day, winning the race in 43 days+10:36:39. There were no women in the race for the first time ever. 2013 saw Russian Vasu Duzhiy win in a close race in 47 days, five hours. Austrian Surasa Mairer ran to the women’s victory in 50 days,4 hours, becoming the oldest finisher ever at age 54. Three women in the race made it the largest female participation ever as the field reached 12 runners again. Ashprihanal Aalto completed twelve 3100 milers, a men’s best total. In 2014 the race enjoyed the coolest temperatures in summer here in New York over the last 20 years. The result was eight finishers, seven runners reaching personal bests. Sarvagata Ukrainskyi finished first in a PB of 44 days, six hours. Sarah Barnett became the second fastest woman ever in 50 days, three hours, her first finish. And Scotsman William Sichel became the first person over 60 to finish the longest race, reaching the coveted finish line in 50 days,15 hours. In 2016, all things seemed to fly with the winds of self-transcendence.Ashprihanal Aaltoran an amazing race, breaking Madhupran Wolfgang Schwerk’s previous record by over 23 hours, reaching 3100 miles in 40 days+09:06:21. He averaged 76.776 miles per day(123.559 km) a full 3km per day better than the German legend.Surasa Mairerreached heights unknown for the ladies, breaking Suprabha Beckjord’s 17 year record in 49 days +07:52:01 (62.848 miles per day,101.144 km) at age 56. Six of the top eight runners registered personal bests. Become to proceed in the inner world." 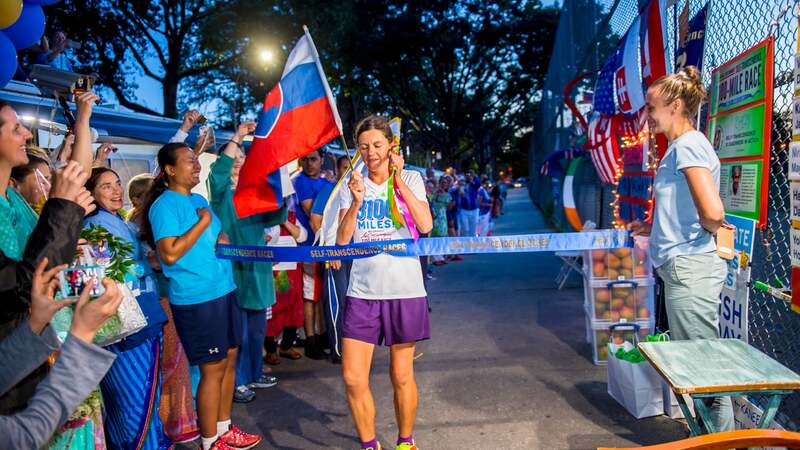 51, of St Petersburg, Russia won the 21st Annual Sri Chinmoy Self-Transcendence 3100 Mile Race for the second time in 46 days+17:38:22. He has completed the longest footrace six straight times. He is still ranked fifth all-time and is one of only five men to average 70 miles a day for the duration of the race. Vasu was serenaded with songs and flowers by a throng of over 120 people.